Humidity/temperature probe with cable | Sondy - vzduchové sondy | Sondy | Typ produktu | Testo, s.r.o. The humidity/temperature probe is suitable for measuring temperature and relative humidity in storerooms, cold storage areas and work rooms or in air conditioning/ventilation ducts. 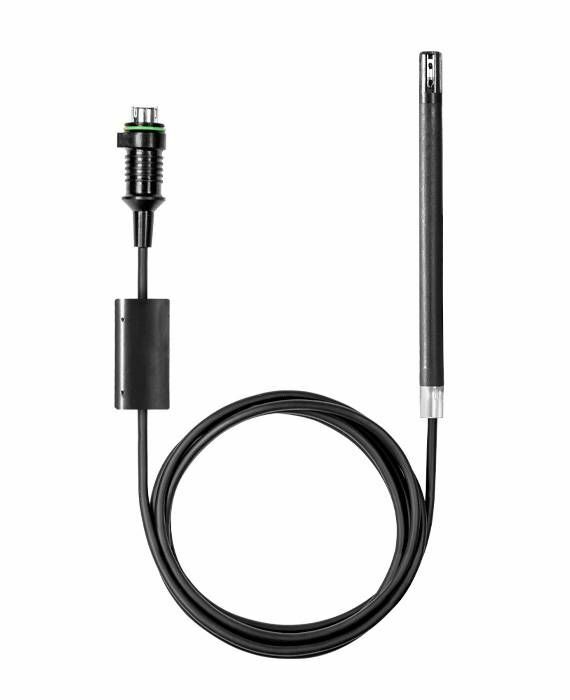 Since the humidity/temperature probe comes with a cable, you can also use it at measuring points which are not in close proximity to the WiFi data logger. The humidity/temperature probe can be installed for long-term measurements. The probe can be installed using a PG gland or clamp, for example (not included in delivery). The humidity sensor for measuring relative humidity is long-term stable, condensation-resistant and traceable to international humidity standards, such as ILAC, PTB and NIST. Thus, even after years of use you can still count on measurement results that are reliable and correct. 1 x humidity/temperature probe with cable 0572 6172.